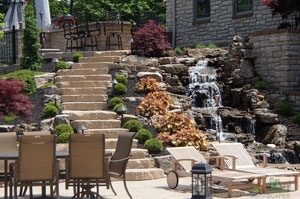 Meyer Aquascapes offers the highest quality water garden and landscaping services in the Greater Cincinnati area and we work with you one on one to provide exceptional personal service. Browse through our extensive galleries or our DIY section to truly find out why our customers keep coming back for more. We enjoyed the whole pond installation experience very much. Our water feature is amazing! So much more than we expected. Everyone loves it! Installing a water garden takes time and planning. We work with the homeowner to determine the best size and location for the water feature. Once your design has been finalized, we will be ready to install your piece of paradise! The addition of a gazebo, bridge, fountain or decorative bench can really enhance your outdoor living area. The possibilities are endless, but they don’t always have to be complicated, time-consuming or expensive. Sometimes the simplest touch can create a difference in the way your water garden looks and feels! We help you select the right location for your new water garden and give you our professional, unbiased opinion. We want to make sure you are 100% satisified, so we help you from beginning to end! Getting the job done right has never been so easy. We will even help you choose plant life and fish for your water garden! 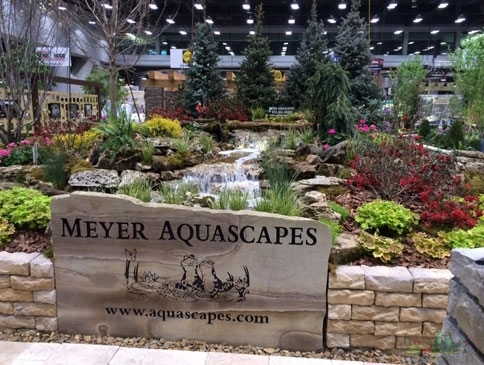 Meyer Aquascapes can help you with your next Water Garden project today. Contact us for a consultation! At your design consultation, we will help you visualize your dream water feature. Some answers that will help us build your ideal water feature are what are you looking for, lakeside living, a koi pond or a mountain stream? Do you want your backyard paradise serene, powerful or entertaining? Homes, driveways, patios and decks are just a few of the items intertwined with water garden design. Incorporating bridges, patios and stepping stones around your feature will help create the perfect spot and the ultimate exterior living space. When dreaming of a water feature for your home, consider something that looks as if it has always existed in the landscape. If your goal is to create a naturalistic feature, you need to look no further than the great outdoors for ideas. Views from your home and surrounding seating areas are always a priority when designing your water feature. Using design elements such as interesting rocks and boulders, aquatic plants and streams help to create a beautiful, natural-looking, low maintenance water feature where you can sit back and relax. 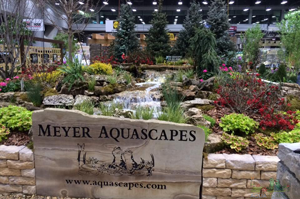 Call Meyer Aquascapes today to create your piece of paradise! We work with you to create a concept and design for your new Water Garden that you will absolutely love for years to come! Our personal service is great, but our attention to detail is even better. Ask us for a consultation today and let us show you what we can do! We have an extensive portfolio including homes, businesses, churches, and much more! We are always creating unique designs that fit the location! 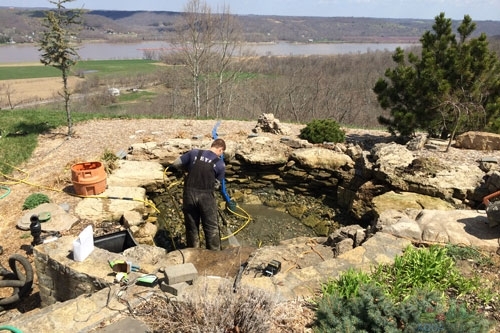 Meyer Aquascapes offers much more than simply water garden design and installation, we also offer pond maintenance! When you own a pond, there is some maintenance necessary to keep your pond’s ecosystem running perfectly. We offer seasonal services that include spring start-up, fall clean up and winter shut down. Taking care of your water garden by choosing the right amount of fish and plants, adding bacteria on a regular basis and keeping it clean of debris will keep your feature looking beautiful all year long. Take a look at our DIY videos for more information on pond maintenance. We are always available to answer any maintenance questions you might have! 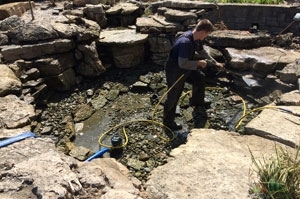 Our water garden maintenance service technicians are professional and detail oriented! We make sure the job is always done right! Our pond maintenance services are priced for the business or homeowner, so you can be sure our services are affordable! Our customers always vote us #1 for our pond maintenance! Call us today and we would be more than happy to show you why.